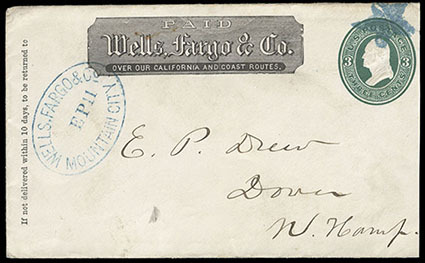 Wells, Fargo & Co., Mason Valley, Nev., oval handstamp on 1874, 3¢ green entire to San Francisco, black company frank, Very Fine and rare, ex-Mader. 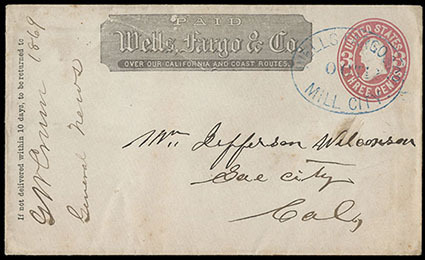 Wells, Fargo & Co., Mill City., Oct. 12, blue oval handstamp on 3¢ entire to Sacramento with black company frank, included is original 1869 enclosure discussing cattle, Very Fine. Wells, Fargo & Co./Mineral Hill/Sep. 28, blue oval handstamp on 3¢ green entire with company frank to Monitor, Cal., with letter dated "Mineral Hill Sept 29/'79", either sender misdated the letter, or Wells, Fargo & Co. Agent forgot to change the date slug in his handstamp, letter comments "The Co. are making money, their mines is very rich, this is the best camp in the state. ", ever so slightly reduced at right from opening, Very Fine and attractive, an extremely rare Wells, Fargo & Co. cancel. Wells, Fargo & Co., Mountain City, Sep 11, blue oval handstamp on 3¢ green entire with company frank to Dover, New Hampshire, matching blue star killer on indicia, slightly reduced at right, Very Fine. 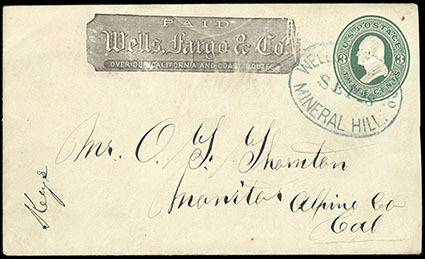 Wells, Fargo & Co., Oneota, Nev., purple oval handstamp (Leutzinger Type 10-25) on legal-size 6¢ Lincoln (U182) entire to San Francisco Cal., docketed "Sept 25th 1882" at left; reduced slightly at right, Very Fine and choice strike, One of only two recorded examples of this oval.. This is an unlisted town in Leutzinger, but it is listed in Gamet's book on Nevada Expresses where the other known example is pictured, which we sold in our Sale 26 lot 436. Wells, Fargo & Co., "Paid 25 Cts. 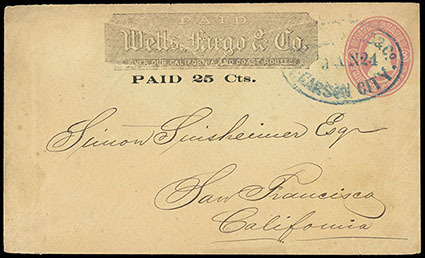 ", black printed frank and surcharge on 3¢ pink (U35) buff entire cancelled by blue "Wells, Fargo & Co., Carson City, Ja 24" oval datestamp from the Sinsheimer correspondence to San Francisco Cal. ; open at top and right, F.-V.F. and scarce surcharged frank, ex-Polland. Thomas No. WFE-211 Estimate $200 - 300. Operated by Wells, Fargo & Co. from August 11th 1862 to 1865. They carried mail and news from Virginia City to Placerville. From Placerville via railroad to Sacramento then by boat to San Francisco. In addition to the adhesive Pony stamps, there were printed envelopes "Paid 25 cts" which were started in 1863. 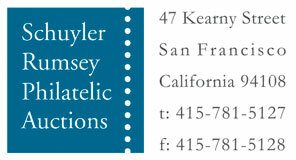 This was for Special Delivery and included "Rapid Letter Service" along the "Pony Trail" to San Francisco. 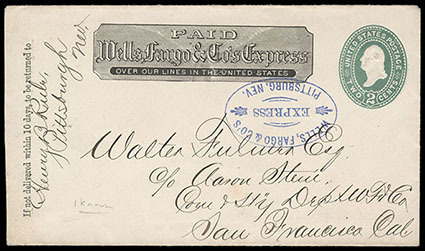 Wells, Fargo & Co's Express, Pittsburg, Nev., perfect strike of bluish violet oval handstamp on 2¢ green entire with black company frank to San Francisco, Extremely Fine and choice. 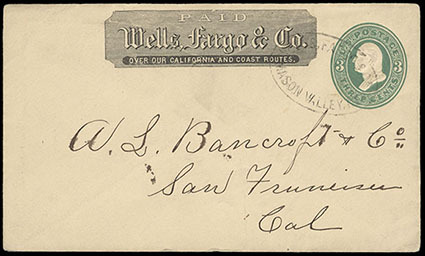 THE ONLY RECORDED EXAMPLE OF THIS WELLS, FARGO & CO. PITTSBURG NEV. MARKING. The camp at Pittsburgh began to grow in the mid-1880s following the initial discoveries in 1878. A townsite was laid out in Crum Canyon at the mouth of Hilltop Canyon. The mines were located about a quarter mile up Hilltop Canyon and a tramway to the mill was constructed. Between 1886 and 1887 $126,000 in gold was produced and Pittsburgh soon had a population of 100 and about 30 buildings were crowed into Crum Canyon. In 1892, production dropped significantly and population fell to about 20, all miners. All the business closed and the miners had to go to nearby Dean for supplies and a drink. The mines and mill were abandoned in 1906. Today, only one old shack still stands. 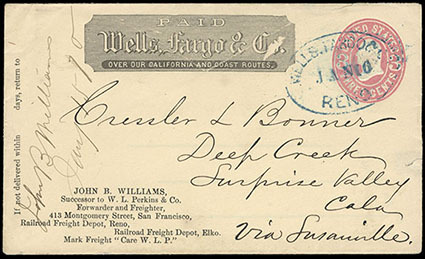 Wells, Fargo & Co., Reno, Jan 16, blue oval handstamp on 1864, 3¢ pink entire with company frank to "Deep Creek, Surprise Valley Cala, Via Susanville", printed advertising corner card of forwarder/freight handler "John B. Williams, Successor to W.L. Perkins & Co." at bottom left, docketed "Jany 15 (18)70"; tiny sealed tear at right, Very Fine. 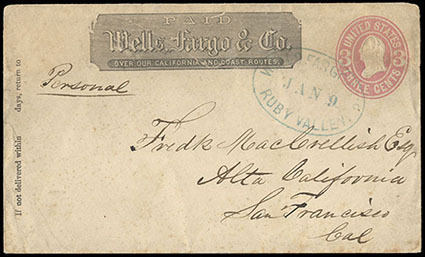 Wells, Fargo & Co., Ruby Valley., Jan 9, blue oval date stamp on 1864, 3¢ entire to San Francisco, light edge wear, Very Fine. 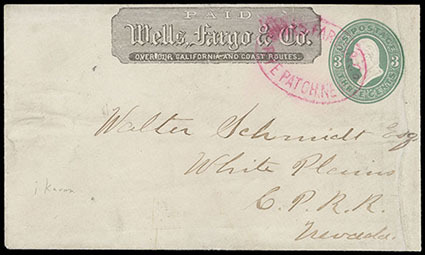 Wells, Fargo & Co., Rye Patch, Nev., magenta oval handstamp on 3¢ green entire to "White Plains, C.P.R.R., Nevada" with black company frank, flap & right side replaced, F.-V.F., thought to be the only known example of this rare Wells, Fargo & Co. marking. With the discovery of gold in California in 1849, eager prospectors and immigrants established a well-traveled wagon trail following the Humboldt River. Some gold seekers eventually left the trail and explored nearby mountain ranges. This exploration led to a silver and gold boom in the 1860s. Towns such as Unionville, Rochester, Star City, Humboldt City and Rye Patch sprang from a sea of sagebrush. As the silver supply was depleted, the towns dried up.